The basic principle of operation is that when a current carrying conductor is brought in a magnetic field (they should not be parallel to each other) a torque on the conductor is produced. The Permanent Magnet Moving Coil instrument consists of a rectangular coil pivoted so that its sides lie in the air gap between the two poles of a permanent magnet and a soft-iron cylinder. 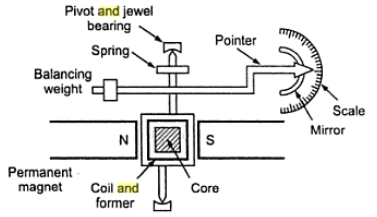 The air gap between the magnet poles and iron core is small and the flux density is uniform and is in a radial direction, so that the flux lines are always at right angle to the current carrying conductor and hence when current passes through the coil, a deflecting torque is produced owing to the interaction between the two fluxes, one due to permanent magnet and the other due to the magnetic field of the coil. This is shown in Fig.1. as NEZ.2r are constant of a particular meter. Hence equation (4.5) suggests that the current is proportional to θ. Thus the scale is uniformly divided i.e. it is a linear scale i.e. if for I amp the deflection is through an angle θ, for 2I amps the deflection would be 2θ.Now if damping torque were absent, the pointer will keep on oscillating around the mean value and an exact reading cannot be recorded. These oscillations are damped out by the damping torque. The moving coil is wound on an aluminium former which is placed in the magnetic field.As the coil rotates eddy currents are induced in the aluminium former and these eddy currents would try to oppose the cause i.e. the deflecting force and finally when the pointer comes to its actual value being measured, damping is provided by eddy currents and the coil (the pointer) remains stationary at its actual value. The controlling torque is provided by the springs and is proportional to the angular deflection of the pointer. Note: Thus the deflection is directly proportional to the current passing through the coil in Permanent Magnet Moving Coil Type (PMMC) Instrument. (e) The possibility of a single instrument being used with shunt and resistance to cover a large range of both currents and voltages. (f) Freedom from errors due to stray magnetic fields.